These wonderful sweets sparkle like sugar-encrusted jewels in French pâtisseries tempting generations of adults and children alike. One bite in the soft intensely flavoured fresh fruit paste and you’re hooked. And they’re pretty simple to make! My first, second and third ever batches surprised me by working so well! 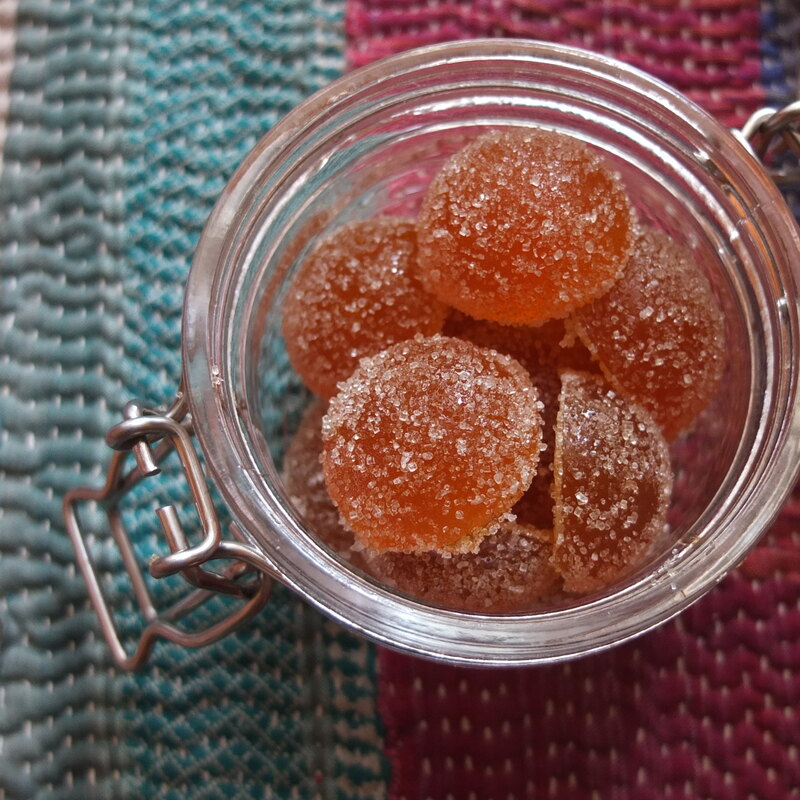 The passion fruit pâtes de fruits are enthusiastically zingy (kepow yum!) 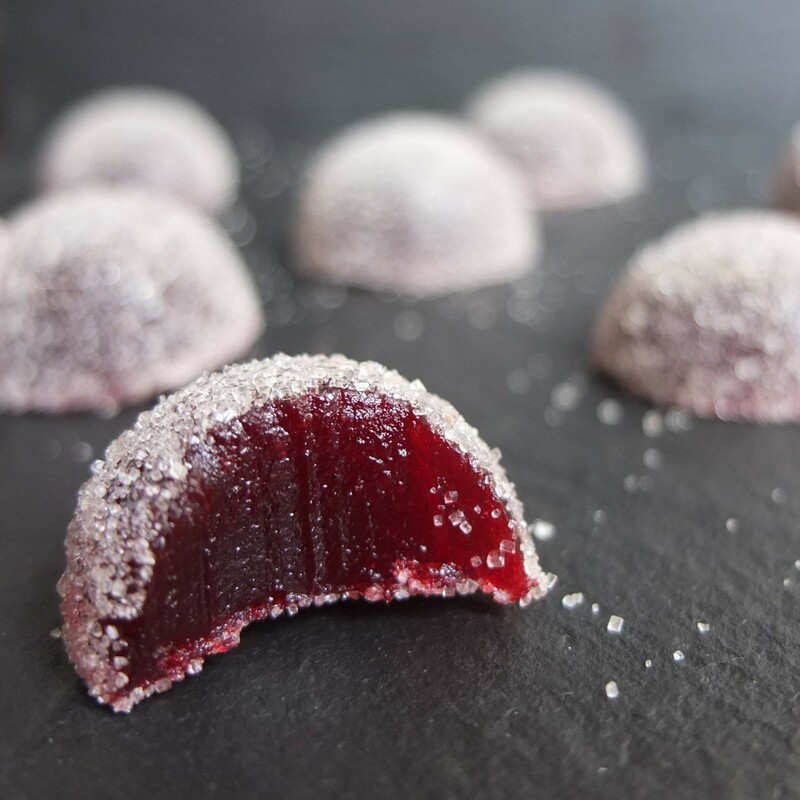 and the raspberry version has a great sweet-tart balance – a friend described them as having lovely layers of flavour. To make these all you need is fruit purée and sugar (I used unrefined caster sugar). Then go online or to a baking shop for two other ingredients: yellow pectin setting agent and to prevent crystallisation liquid glucose. 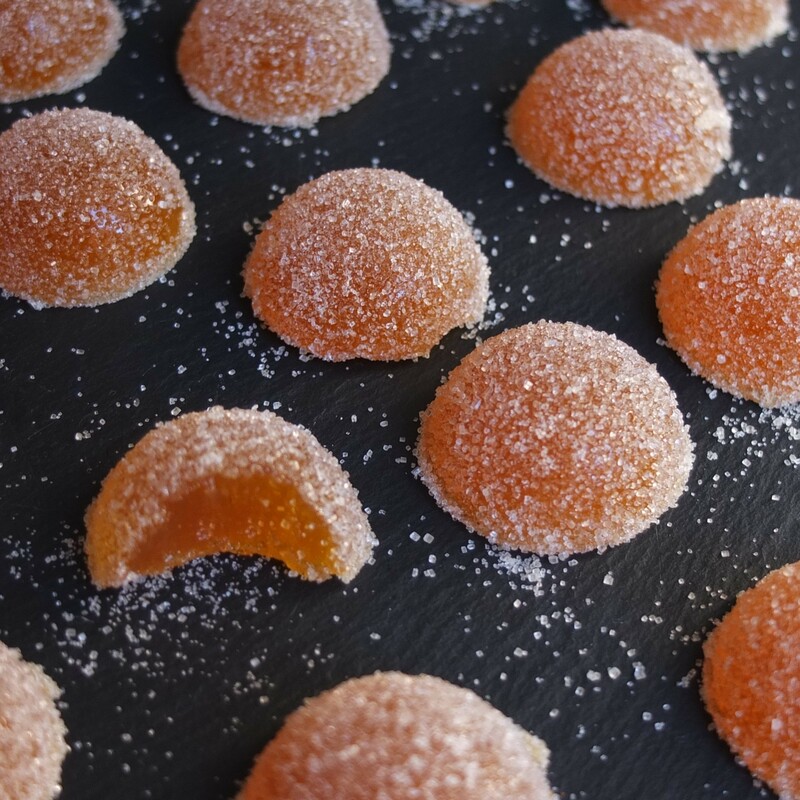 Add a little lemon juice and we’re set … or rather the French fruit jellies are set! Ho ho… It’s totally worth making these at home. They’re naturally gluten-free, vegan and almost half the content is natural fruit thus contributing to your five-a-day! Well we all need our sweet treats don’t we? 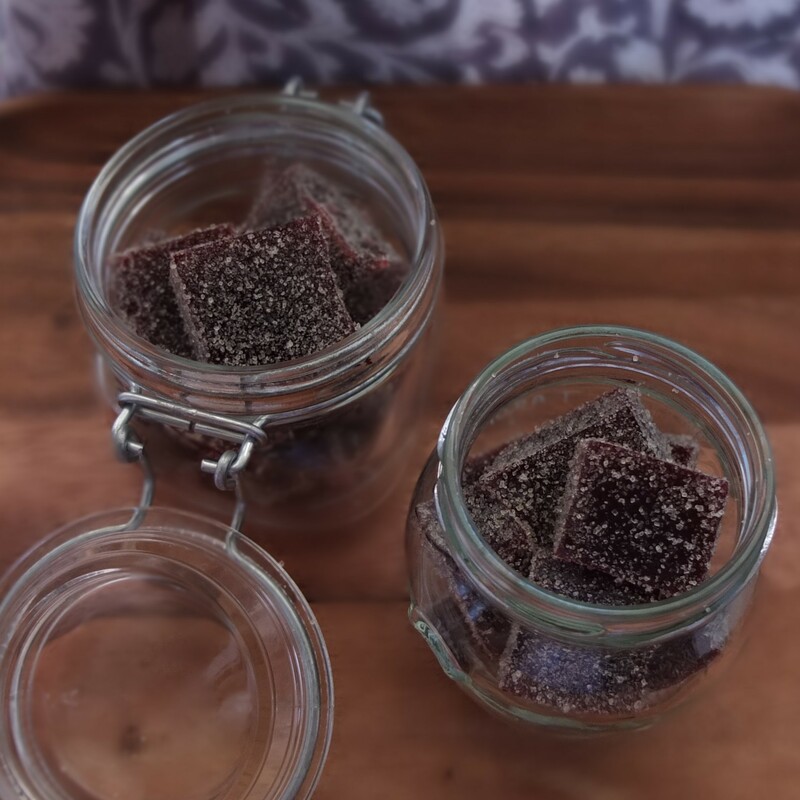 Can I tempt you to a raspberry pâte de fruits, aka fruit jelly..? Yum yum. Tested and approved by friends and my French mum too by the way. 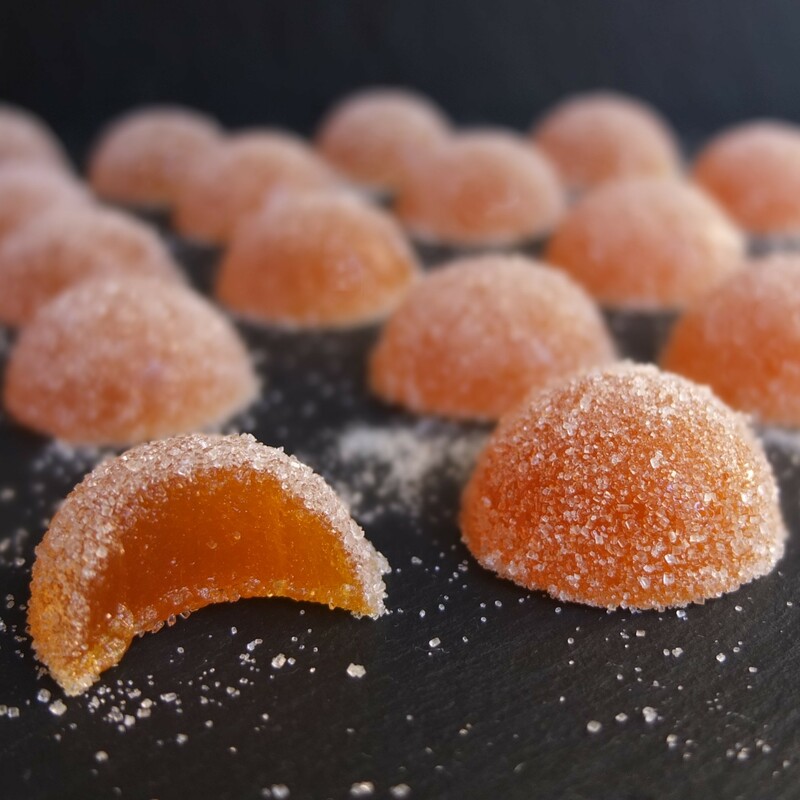 They’re adapted from the passion fruit and apricot pâtes de fruits by Mercotte, the well-known French blogger and TV personality. Some other online recipes use more lemon juice and pectin so I increased the quantities a little. The raspberry ones need less sugar than the sharper passion fruit. And I used unrefined golden caster sugar but standard granulated or caster sugar is fine. 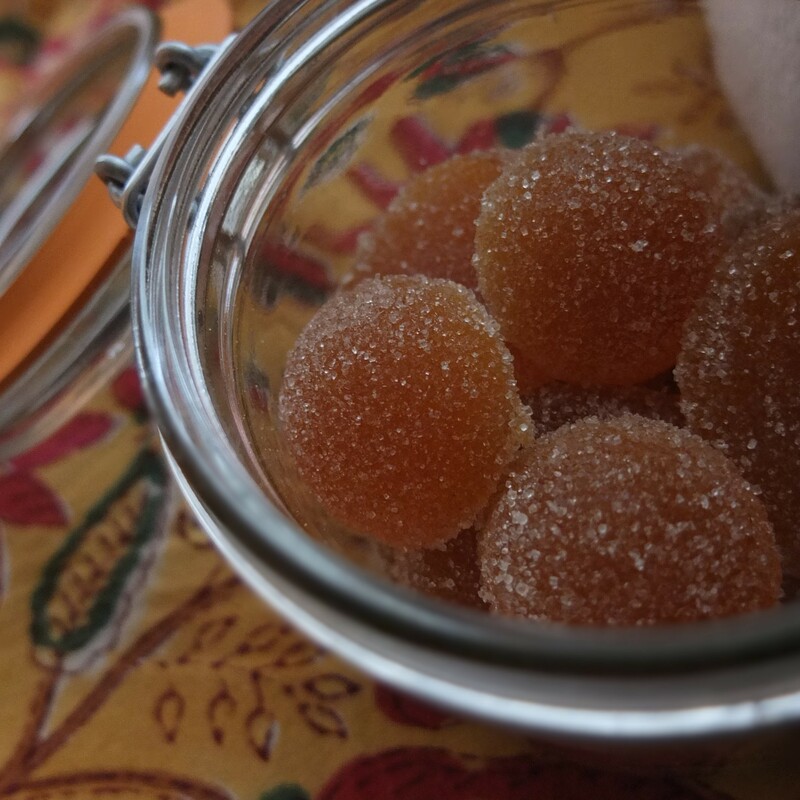 You could adapt with other fruit purées but check online as the quantities of pectin vary for different fruit. What I love about raspberry and passion fruit is they have an abundance of flavour and character that shines through the sugar. I use this 24-hole mini semi-spheres silicone mould (here at amazon.com) and two of these should work for the quantities below. But you can use any flexible silicone moulds (see photo). 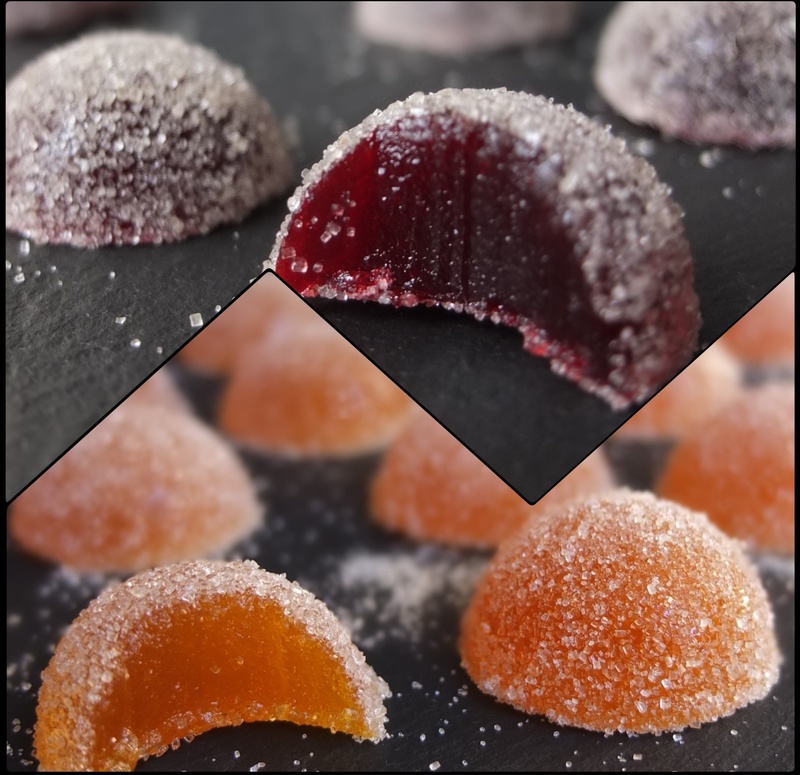 With different shapes you can even make Easter jellies or cut up bars but my favourites are the little mini domes – they’re just the right size, not so small that surrounding sugar crystals dominate but not too big either. You can also use a square baking tin (8x8in/20x20cm or 9x9in/23x23cm) lined with baking paper or heatproof plastic wrap then cut into squares the next day. Other suggested equipment: sugar thermometre (a handheld probe is handy for moving around when whisking); heavy-based saucepan; and silicone whisk that won’t scrape the saucepan. Weigh out and prepare all the ingredients and moulds before starting. 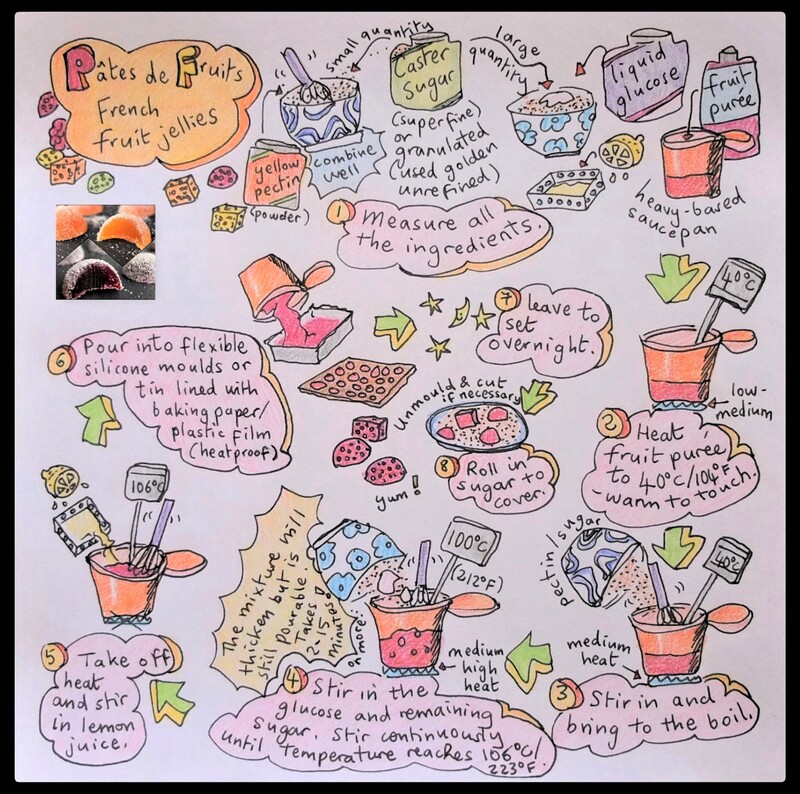 Liquid glucose is sticky so it’s easier if you weigh it out on top of the larger quantity of sugar (it’ll fall into the saucepan more easily) and it’s also easier to weigh it with a digital weighing scale rather than a tablespoon. Use good-quality fruit purées, fresh or frozen (defrost on very low heat first). 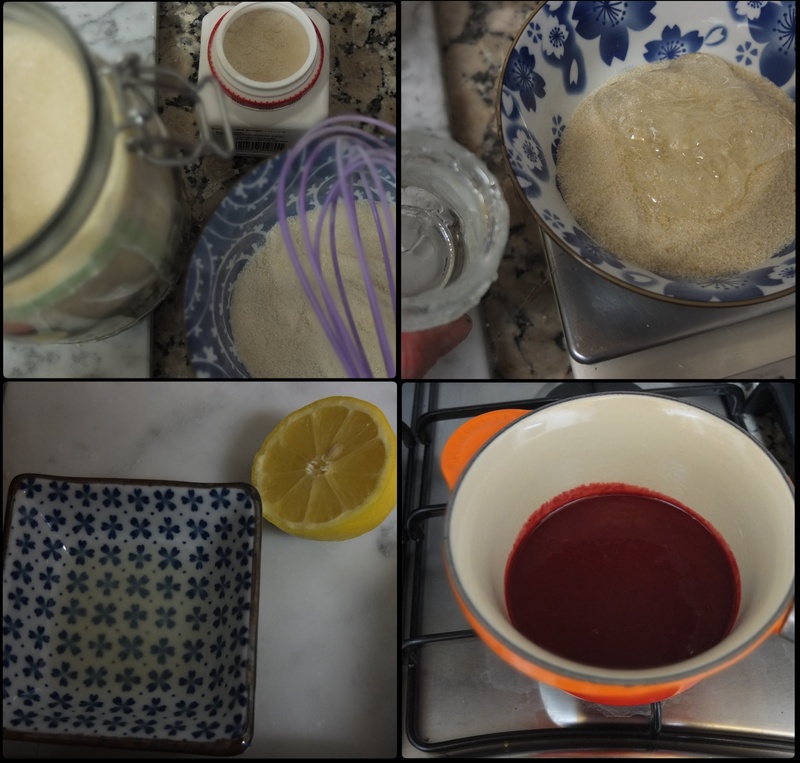 Mix the pectin and smaller quantity of sugar very well – separating out the grains of pectin with sugar makes sure it doesn’t get lumpy in the purée. Stir continuously but not fast to make sure nothing gets stuck to the bottom. The temperature on my probe thermometre fluctuated a lot: up a few degrees then down a few, going to 105ºC then back down to 102ºC then slowly up to 103ªC. After 10-15 minutes I felt the mixture thickened enough and didn’t need to wait for 106ºC or 107ºC. It worked fine and was actually quite thick (great for a firmer jelly). So stay reasonably flexible regarding your thermometre readings (maybe your thermometre’s more precise than mine). 250g/ml seedless raspberry purée, from fresh or frozen fruit – if using a ready-made purée with sugar content then adjust quantitties accordingly. For Capfruit purée (10% sugar): 275g/ml purée with 60g + 200g sugar. 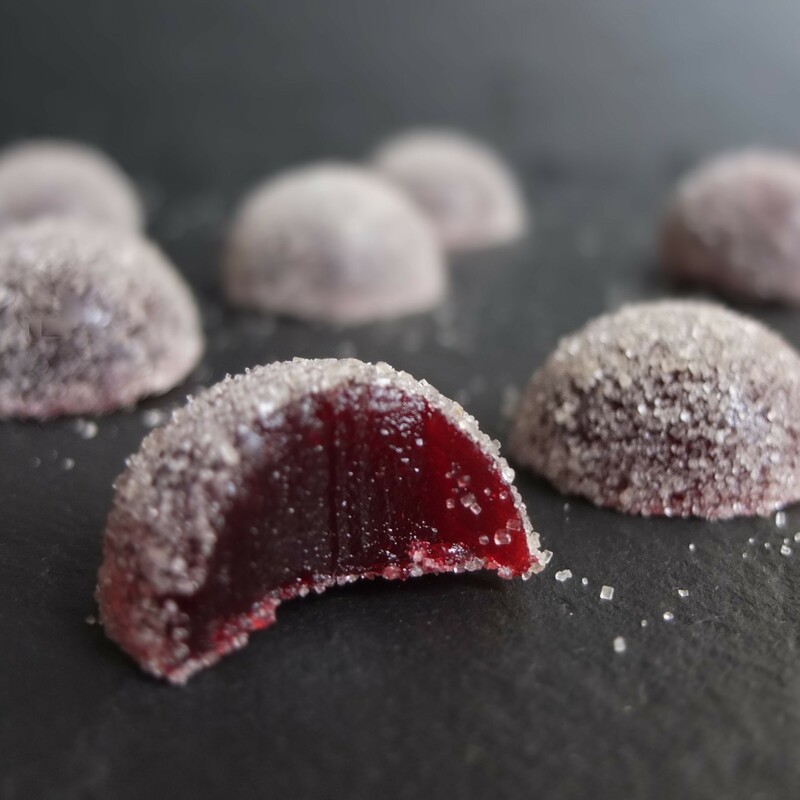 500g/ml seedless raspberry purée, from fresh or frozen fruit – if using a ready-made purée with sugar content then adjust quantitties accordingly. For Capfruit purée (10% sugar): 550g/ml purée with 120g + 400g sugar. It’s a bit messy pouring the liquid into the moulds. Chefs do it with a piston funnel – I’m resisting buying yet another kitchen appliance but if your liquid is fluid enough it’s meant to work well. Otherwise get a neater final finish by peeling off extra paste around the shapes before it sets completely. If using a baking tin the size of squares you cut is up to you. For a 23cm/9in tin: 9 strips 2.5cm/1in wide cut again into 2.5cm/1in squares works quite well, giving you 81 sweeties! For an 20cm/8in tin: 8 strips 2.5cm/1in wide. Or 3cm/1 and 1/5 inch squares could work too. These have an intense sour-sweet taste you might love as I did. But to mellow it out replace up to half the purée with mango or apricot (it should also be possible to dilute the flavour by replacing some with water). 250g/ml seedless passionfruit purée, from fresh or frozen fruit – if using a ready-made purée with sugar content then adjust quantitties accordingly. For Capfruit purée (10% sugar): 275g/ml purée with 60g + 240g sugar. Also later made a passion fruit – apricot version. Delicious! Lovely balance of tangy passion fruit and fragrant apricot. 90g/ml apricot purée (both from fresh or frozen fruit). If using a ready-made purée with sugar content then adjust quantitties accordingly. For Capfruit purée (10% sugar): 175g/ml passion fruit purée + 100g/ml apricot purée with 60g + 230g sugar. 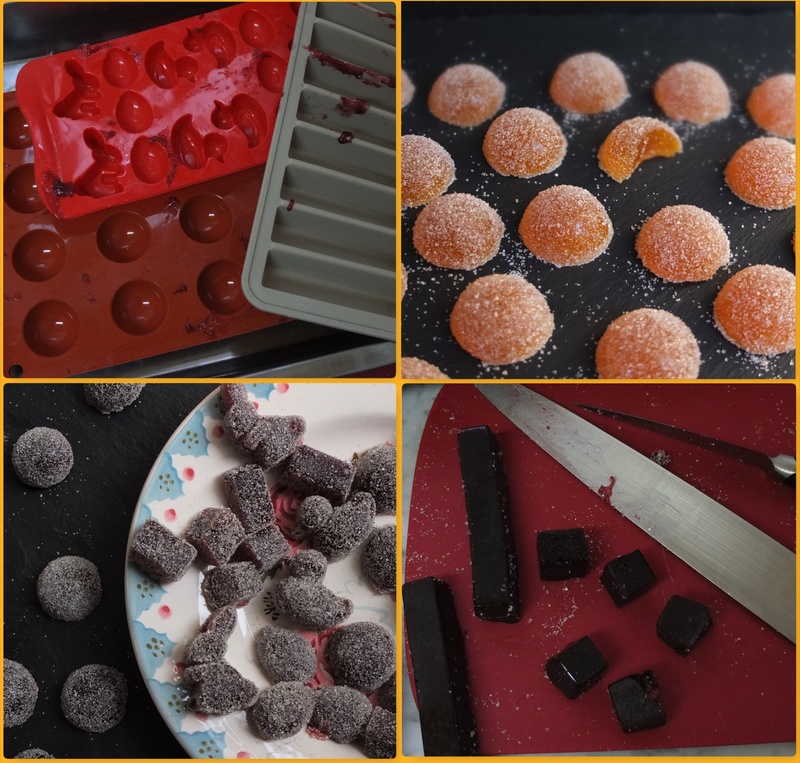 Mercotte has made a blackcurrant and passion fruit version which I also adapted and tried – yummy! Other fruit traditionally used are apples, quince, lemon, orange, etc. They make a lovely present in a pretty plastic bag, jar or box. Store at room temperature in airtight tupperware, like a sealed glass jar. They should keep at least 1 or 2 weeks, depending on the humidity where you are and how fast you eat them… Just one more? Have some raspberry and passion fruit pâtes de fruits! Mummm yes, I’m tempted! They look delicious. Good to see you back among us, Lili. You always come up with something delicious. These look so good and so cute!